What is a "Rife machine"? A Rife machine is a research instrument invented by Raymond Royal Rife. Rife machines are devices which emit audio frequencies or radio frequencies applied in some fashion to an individual with the intent of bettering the individual's health. They are used by experimenters, both practitioners and private users alike, to influence the body in making chemical changes. We use the term experimentation deliberately, as that is exactly what this is. A true "Rife machine", of course, is one made by Royal Rife himself. All others must be considered copy cat devices, simply based on his theories. 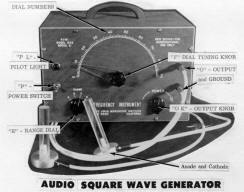 Most of these devices are referred to as a "frequency generator" and are highly theoretical and experimental in nature. A Rife machine presumably works on the principle of sympathetic resonance, which states that if there are two similar objects and one of them is vibrating, the other will begin to vibrate as well, even if they are not touching. In the same way that a sound wave can induce resonance in a crystal glass and ultra-sound can be used to break up kidney stones, a Rife machine uses sympathetic resonance to physically vibrate offending bacteria, viruses and parasites resulting in their destruction and elimination from the body. Several types of modern day "Rife machines" exist. Some with hand-held cylinders or contact pads connected to audio generators, while others use high voltage and wattage to energize plasma lamps, similar to fluorescent tubes, while the individual sits nearby, being exposed to the modulated light energy. For more details on today's modernized versions of Royal Rife's frequency machine, please see the frequency generator page here. Note: These devices have not been approved in the U.S. for treating illness with humans. It has, however, been approved for use in veterinary applications in the US. Little formal medical research has been done in the US; however, several types of frequency devices are medically licensed in Germany and a few other countries. Side note: of course these devices don't "work" for everyone. What does? But it raises many questions. Why not? Were these unsuccessful people using the right frequencies? Was their device underpowered? Were they too late? Were they still smoking, drinking, and eating GMO processed dead food and tap water? Were they continually exposed to environmental toxins that continually poisoned their bodies and kept their immunes from working properly? How many vaccines were they given in their lifetime? There are many issues to be examined. For those who want to learn more about Royal Rife, his amazing machines, and up-to-date research in this field, we highly recommend the following book. A large amount of history in using frequency devices is included. Extremely interesting and valuable reading!! Phyllis A. Balch, CNC and author of "Prescription for Herbal Healing, Prescription for Dietary Wellness, and Prescription for Nutritional Healing" has this to say: "This meticulously researched book examining the discoveries and inventions of Royal Raymond Rife provides new and ample documentation to lend credence to his theories. In addition, Dr. Silver's supporting information on a variety of wellness issues is fascinating. The chapters 'The Politics of illness and the Nature of Health' and 'Suggestions to Strengthen and Support Your System' are a compilation of cutting edge data, brilliantly interpreted. It is rewarding to see a new generation of health professionals postulating what I have been saying for 30 years. 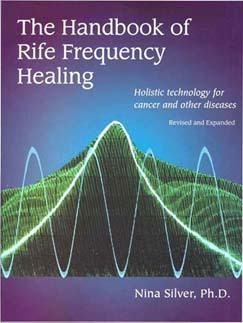 If you are interested in exploring Rife frequencies as an alternative source, or in acquiring new information to help with decisions about your health, this book will be a valuable addition to your library." Chances are, you've heard about this device. It's very popular. Sorry we don't display this device right here. Certain FDA restrictions prevent that. We can however email you the information immediately with the link below. After that, we urge you to call or email us with any questions! Or, call to speak with someone. Has up to 9 times higher output than others. Creates both Audio and Radio frequencies. Runs Sine AND Square waves. Four points of contact, instead of just two. Has other features that competitors do not. Comes with EASY instructions and DVD Guide. Rife Machine Page Disclaimer: We are not licensed medical professionals, nor do we imply so. We do not prescribe, diagnose, or provide medical services or advice in any way. Statements contained on these pages about a frequency generator, alternative medicine, holistic health, or any other topics have not been evaluated by the Food and Drug Administration. The information found here is not intended to diagnose, treat, cure, or prevent any disease. Suggestions and ideas presented in this document are for information only and should not be interpreted as medical advice, meant for diagnosing illness, or for prescriptive purposes. Readers are encouraged to consult their own health care provider before beginning any protocol such as diet change, Dr. Clark body cleansing, magnet therapy, ozone, Kangen water, "rife machine" therapy, or any other alternative medicine. Rife machine page is for information only.